A handful of berries a week could make a difference in preventing memory loss, suggests a new analysis of the Nurses' Health Study (NHS). Typically older adults experience gradual memory decline as the years pass. In the study, women with increased berry intake slowed their memory decline by as much as 2.5 years. The best part? 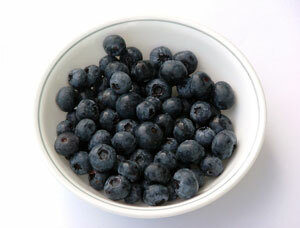 The benefits of berries were seen with just one serving of blueberries a week or two servings of strawberries. The cognitive-boosting benefits of berries is likely a result of the high amounts of flavonoids they contain. Flavonoids are plant pigments with powerful antioxidant and anti-inflammatory properties. In particular, berries have a subclass of flavonoids called anthocyanidins which "can cross the blood-brain barrier and localize in the hippocampus, known to be an area of the brain involved in learning and memory." Since inflammation and oxidative stress may contribute to cognitive impairment, anthocyanidins could slow cognitive decline in older adults. The study echoes results from other research suggesting the benefits of certain flavonoids in reducing the risk of stroke. The study analyzed data from the Nurses' Health Study, a cohort of 121,700 female nurses aged 30-55 years old. NHS tracked participant's lifestyle choices starting in 1976. From 2011 to 1995, a subgroup of women ages 70 and up were evaluated for cognitive function every two years. The researchers then compared these results with over 20 years of data on the women's berry consumption. It's important not rely on one food to prevent cognitive decline. Other factors like exercise and socioeconomic status likely influenced the results in this study, analysts not involved with the study pointed out. Dr. David Knopman of the Mayo Clinic told Medscape Medical News that studies on the association of dietary habits and health outcomes are "notoriously hard to replicate." Although there's no magic food or vitamin that will prevent cognitive decline, a diet rich in vegetables and fruit combined with a regular exercise routine may be the best way to prevent a number of diseases and disorders. A chiropractor trained in nutrition can assist you in making healthy dietary choices to maximize your health. Devore E, Kang JE, Breteler M, and Grodstein F. Dietary intakes of berries and flavonoids in relation to cognitive decline. Annals of Neurology. E-published ahead of print. DOI: 10.1002/ana.23594. Lowry, Fran. Eating Berries Linked to Delay in Cognitive Decline. Medscape Today. May 1, 2012. Accessed May 2, 2012. http://www.medscape.com/viewarticle/763013.